Created as a "take-away" tool to accompany the TACSEI Six Steps of PBS (Positive Behavior Support) learning modules, this Word document is a complete reference that outlines the entire PBS process. The "Making Life Easier" series is designed specifically for parents and caregivers. 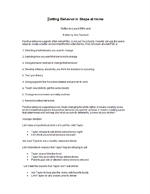 This series of tip-sheets contains valuable information on how to make often challenging events easier to navigate, and even enjoyable, for both caregivers and children. Doctor and dentist visits can be very stressful for young children. Routine check-ups can cause anxiety, fear and distress in toddlers and preschoolers. 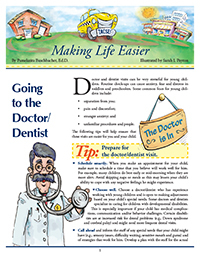 In this Making Life Easier issue, adults are provided with tips to prepare the child for these appointments and make visits to the doctor or dentist less stressful for everyone (December, 2013). While the holiday season is filled with enjoyable activities, events and traditions, it can also be a hectic and stressful time. 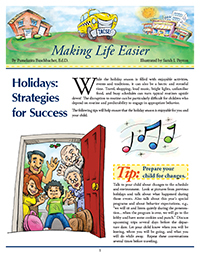 This installment of the Making Life Easier series provides several proven strategies to help make the holiday season enjoyable for you and your child. Also includes a handy tip card for quick reference. (November, 2013). Many families find bedtime and naptime to be a challenge for them and their children. This first installment of the Making Life Easier series provides a few proven tips for making bedtimes and naptimes easier for both parents and children. Also includes a handy tip card for quick reference. (November, 2010). Running errands (e.g., going to the store, bank, etc.) is one of those essential household routines that all families experience. While there can be huge benefits in taking your young child along, running errands can be extremely difficult if the child has challenging behavior. Still, there are several steps you can take to help you and your child get the most out of these outings. Also includes a handy tip card for quick reference. (November, 2010). For many families, changing a child’s diaper can be a major battle. This installment of the Making Life Easier series provides several proven strategies to help make diapering a positive and relationship building experience for you both. Also includes a handy tip card for quick reference. (November, 2010). Degree programs at USF in Applied Behavior Analysis for Bachelor's, Master’s and PhD degrees. Strategies and resources to address these behaviors, and to help support you and your loved one with autism during these difficult situations. Strategies to help parents who have children who are experiencing teasing and harassment. Appears to be designed for typical children but strategies could be adapted for ASD. This project is designed to support teachers, administrators, and related services personnel in building district-wide capacity to address challenging behavior exhibited by students in regular and special education programs. Provides (a) technical assistance to encourage large-scale implementation of PBIS; (b) provides the organizational models, demonstrations, dissemination, and evaluation tools needed to implement PBIS with greater depth and fidelity across an extended array of contexts; and (c) extends the lessons learned from PBIS implementation to the broader agenda of educational reform. Takes the research that shows which practices improve the social-emotional outcomes for young children with, or at risk for, delays or disabilities and creates FREE products and resources to help decision-makers, caregivers, and service providers apply these best practices in the work they do. Resources to help teachers and parents/caregivers work together to help young children develop social emotional skills and reduce challenging behavior. The major goals of the center are increasing our understanding of autism spectrum disorders, the development and implementation of state-of-the-art pivotal response treatments, as well as the improvement of elementary and secondary education efforts for children with autism and other severe disabilities.